You are here: Home / Arts / Victorious Voices 5th annual High School Slam Poetry Championships. April 7-9th 2014. Victorious Voices 5th annual High School Slam Poetry Championships. April 7-9th 2014. I don’t get out to as much poetry (slam, spoken word, readings) as I would like, but I always make time and space in my calendar for Victorious Voices. Director Jeremy Loveday has impressed me with his passion for mentoring since the first time I met him in early 2011. April marks the 16th annual National Poetry Month in Canada; I can’t think of a better way to celebrate poetry than by encouraging the up-and-coming generation of poets. Last year, other than a few parents of participants, and the celebrity judges, I was hard-pressed to note many adults over 40. It’s time to change that! These youth have a voice and they want to be heard. You will be impressed with their word-smithing, their artistry, and the difficult subject matter they are willing to tackle. Did you know that Victoria is the only city in Canada with a Youth Poet Laureate—currently Morgan Purvis. Victorious Voices—the Lower Island high school poetry slam championships—are ready to prove to you that Victoria’s youth are anything but apathetic. “It’ll blow you away” says Victorious Voices Director Jeremy Loveday. “These youth speak their truth powerfully. The best way to celebrate their voices is to come and listen, really listen”. A poetry slam is a competition where poets are judged by audience members on a scale of 0-10. Poets have 3 minutes and must perform original work, without costumes, props or music. 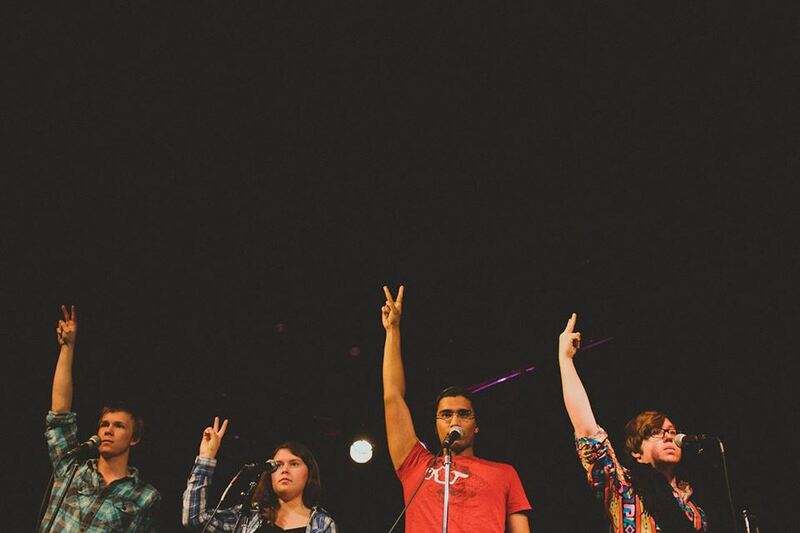 Victorious Voices is a team competition, and teams are required to perform group pieces as well as individual poems. Victorious Voices is one of the most inspiring and entertaining poetry experiences of the year. Audience members are invited to boo the judges, cheer wildly, and participate in call and repeat chanting throughout the night. 8 teams from across the lower Island will compete for the Victorious Voices title. In poetry slam, there is common saying that “the points aren’t the point, the point is the poetry”. With Victorious Voices, this couldn’t ring more true. Victorious Voices celebrates the youth voice and the youth experience. “It is stunning, the way they speak from their hearts. Us adults, we’re just lucky they let us come and listen”. Will you come and listen? Apil 9th – Finals Night! Watch as the top 4 teams compete for the Vic Voices Championship! $5.Victoria Events Centre Doors 7:00pm Featuring: DJ Big Tiny Smalls, an opening poem by Victoria Youth Poet Laureate Morgan Purvis, Celebrity Judges, and the Alumnus of Honour Showcase.